If you’ve never tried quinoa, try it. It’s so easy to prepare and also so versatile. You can make it into breakfast dishes, salads, sides, baked goods, and casseroles. You cook it just like you do rice. It’s a simple 2-1 ratio. Two cups of water for one cup of quinoa. It’s typically found with the rice and other grains in the grocery store. My husband, who isn’t the most adventurous eater, loves this salad–when I omit the cucumber, tomato, and cilantro. The poor fellow rarely gets to eat it though, because those are my favorite add ins! I like to keep it in the fridge and grab it for quick meals on the go. SERVES: 12 (1 cup each) Prep Time: 30 min. Cooking Time: 12 min. 1. Combine lime juice, cumin, and salt in a medium bowl; whisk to blend. 2. Slowly add oil, while whisking constantly. Set aside. 3. Combine beans, vinegar, and pepper (if desired) in a medium bowl; mix well. Set aside. 4. Bring water to a boil in medium saucepan over high heat. 5. Add quinoa. Reduce heat to medium-low; cook, covered, for 10 to 12 minutes, or until all water has been absorbed. Remove from heat. Cool for 15 to 30 minutes. Set aside. 6. Place cooled quinoa in a large bowl. Fluff with a fork. 7. Add bell peppers, corn, cilantro, bean mixture, and dressing; toss gently to blend. I made it tonight and omitted the bell peppers. I also always use one can of black beans and one can of chick peas. (Ignore the two cans of chick peas above. I didn’t realize I’d grabbed the wrong can out of the pantry until I had already begun chopping veggies and had ripped open the box of quinoa.) I always add a cucumber and a tomato as well. You could add in so many different veggies. It’s wonderful tossed with feta. My favorite part is the cumin. And the cilantro. Give me allllll the cilantro! It’s so healthy and so good! Meatloaf. Just that simple word brings many things to mind. A dry flavorless brick of beef smothered in thick gloppy ketchup. The singer who performed many hits beginning in the 70’s. He would do anything for love, but he won’t do that. What is that? I’ve always wondered. We didn’t eat a lot of meatloaf in my family when I was growing up. My mother cooked it off and on and after 10 years of marriage, my daddy finally spoke up and told her that he didn’t really care for meatloaf. I’ve recounted that story to my husband many times and told him that if doesn’t like something that I cook, he’d better let me know or else he’d be eating it for years to come! Before Henry and Massey were born, aka Simpler Times, I would record and religiously watch every episode of The Kitchen on Food Network. It’s a cooking show that features 5 different chefs. One of my favorite is Sunny Anderson. Her personality matches her name. She’s bright and colorful and always upbeat. One day she shared a meatloaf recipe that looked unlike any meatloaf I’d ever seen before. It wasn’t dry and tasteless. It was juicy and looked amazing. I tried it and we’ve been hooked ever since! masher. Taste and season with salt and pepper if necessary (the mix packet contains lots of seasoning, so you probably won’t need to). Add the egg and stir. Pour all but 1/2 cup of the flavor base (tomato mixture) over the top of the beef. with aluminum foil for 10 minutes to allow the ambient heat to bring it to 160°F before slicing and serving. Most people have a love or hate relationship with pumpkin spice flavored foods/drinks. This year, I am in love with pumpkin spice. Count me in for Team Pumpkin Spice. All the way. Henry is playing soccer with the Walton County Recreational League. If you’ve never watched 3 and 4 year olds play soccer, stop what you’re doing and locate a game. It is the funniest thing you’ll ever see. You get to witness an entire range of emotions in 45 minutes in one child. Henry usually begins on a high note, calling himself a soccer star, but the minute someone else touches him, it’s all over. Done. Crying, whining, wailing. Falling out on the ground. For about 10 minutes he’s completely put out and then, out of nowhere, he usually regroups and joins the team. Usually. The County randomly issues jersey colors and allows teams to choose their own names. After receiving our burnt orange jerseys, one mom from the team exclaimed, “Team Pumpkin Spice,” and the name stuck. Sometimes the highlight of the game is the coach saying the game has ended and snacks are dispersed. My children have become obsessed with all things pumpkin and all things Halloween. Massey loudly yells, “Punkin,” anytime we see jack o’lanterns or decorative pumpkins. I’ve even caught myself asking the Publix employees about the price of the punkins. I decided to take advantage of their love of pumpkins and bake some pumpkin cupcakes. With cream cheese frosting, of course. If you’re a pumpkin fanatic like my children, or a spice fanatic, or just a huge fan of fall, you’ll love these moist and tasty cupcakes! You could also leave off the cream cheese frosting and call them muffins, but where’s the fun in that!?! Make the Cupcakes: Preheat oven to 350º. Line a 12-cup muffin pan with paper liners; set aside. In a medium bowl, whisk together the flour, baking powder, baking soda, salt, cinnamon, and pumpkin pie spice; set aside. In a large bowl, whisk together the pumpkin, both sugars and the vegetable oil until completely combined, making sure to break up any chunks of brown sugar so no lumps remain. Whisk in the eggs, one at a time. Add the flour mixture in two additions, folding and mixing well. Make the Frosting: With an electric mixer on medium-high speed, beat the butter until fluffy, 2 to 3 minutes. Add the cream cheese and vanilla and continue to beat for an additional 2 minutes, scraping the sides of the bowl as needed. Reduce the mixer speed to low and add the powdered sugar gradually and mix until smooth and combined, scraping down sides of bowl as needed. Increase the mixer speed to medium-high and beat until light and fluffy, 1 to 2 minutes. I garnished mine with a sprinkle of nutmeg of cinnamon. I start by boiling a whole chicken. I add lots of salt, pepper, and thyme to the water. Once the chicken has cooked through, I remove the skin and pull the meat from the bones. We eat both white and dark meat, but if you prefer only white, simply cook white meat only. Reserve the broth for the dumplings. Mix 2 cups plain flour, ¾ cup self-rising flour , ½ cup oil, and a ½ cup cold water, and salt to taste in a bowl. Cover with a towel and refrigerate until chilled, usually 10 minutes or so. Place the broth back onto the stove and turn to medium-high heat. Bring to a very low boil. Roll out dough on a floured surface. The thickness of the dough determines how thick your dumplings will be. I’ve found that rolling the dough to about a ¼ inch thickness works well for us. Cut the dough into individual dumplings and carefully drop into broth. Once all of the dumplings have been added to the broth and are floating, carefully add chicken. Continue to simmer until thoroughly cooked. I recently took the boys north, across the Choctawhatchee Bay, to Freeport, to visit The E. O. Wilson Biophilia Center. The center was started in 2009 by a Walton County resident who wanted to educate others about the importance of conserving the world’s biodiversity. The term biophilia means the love of all living things. That philosophy is brought to life at the Biophilia Center. The center is located on the Nokuse Plantation, which, at almost 54,000 acres, is the largest privately owned nature preserve in the Southeastern United States. There is a large area for parking with a short walk to the main building. Upon entering the open and spacious front foyer, you are greeted by a large bird and a large ant. The boys immediately began giggling and couldn’t wait to run ahead to the Exhibit Hall. One of the first interactive displays was this turtle tunnel that allows you to crawl through and experience life as a sea turtle. This had such a big impact on Henry, he was awake the next morning telling me all about an exciting dream he had just had where he was a sea turtle! The boys were amazed by the Honey Bee Exhibit which shows bees in action! There’s an exhibit that allows you to put your hands into a dark hole and feel things such as alligator heads and tortoise shells. I passed on that one, but Massey loved it! Henry stood and talked to the snakes for a while. There are scheduled exhibits throughout the day, many involving up close and personal experiences with the animals. Henry and Massey weren’t interested in sitting and listening to any kind of educational talk, so we skipped those, but if you have children who are older or who have an attention span greater than 60 seconds, definitely plan on taking part in those experiences! After passing through a side porch, complete with a water table, a chalk table, and a sand table, you can climb Native American mounds and walk through a Florida Cracker House. While outdoors, you can tour the Biophilia Garden and see the Birds of Prey exhibit. We highly recommend visiting the E.O. Wilson Biophilia Center! We plan on going back very soon! Stephanie Anliker, mompreneur and owner of The Green Owl, recently hosted the contributing writers of the Destin 30A Moms Blog. She served delicious hors d’ oeuvres (I had to google the spelling on that one) and wine while we shopped—without children! Stephanie shared her amazing and inspiring story of how she started her organic soap and shea butter body care line and how it grew into the far reaching business she runs today from her shop in Seagrove. And she didn’t stop with just body care products, she also has her own line of authentic Turkish towels. If you’ve never used a Turkish towel, you don’t know what you’re missing! They are one of the most versatile products that you can buy! Seriously, the possibilities are endless! Stephanie demonstrated so many uses for one towel—sarongs, throws, cocoon shoulder wraps, shower curtains, gift wrap (I’m not even kidding), and the list goes on and on. Mind=blown. Sara wrote an awesome post on the versatility of the Turkish towel over on the Destin 30A Moms Blog, Turkish Towel::My Ride or Die Mom Accessory. Stephanie also carries tea towels with witty sayings and vintage pictures, cute cute soap holders, Bloody Mary mix that is made locally, and so many other items! I mean, where else will you find a hair scrunchie!?! We’ve all used them and secretly wish we could still get our hands on one…well, wish no longer! They’re available at The Green Owl! If you are in the Santa Rosa Beach area, stop by The Green Owl and check out everything Stephanie has to offer! She also has a website and can ship to you! The Green Owl is located in Seagrove at 3723 East C-30A in Seagrove Plaza. Check her out on Facebook and Instagram as well! 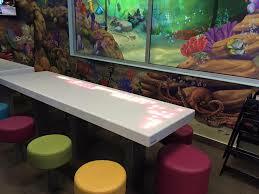 I recently heard about a McDonald’s in Niceville that had an indoor play center with an underwater theme. Henry and Massey have never even seen a fast food play center, so I thought this would be very exciting for them. I decided to drive up the next time we had a rainy day. Little did I know how soon that would happen. South Walton and 30A is known for fabulous food. We love dining out and trying new places, but every now and then I get a hankering for McDonald’s French fries. They’ve always been my favorite. In high school, I would often walk from our house in Meadowbrook to McDonald’s, order fries and a coke, and walk back home. Oh the days of rapid metabolism…Henry and William got very excited when I told them we were going to McDonald’s. William even got up before 10:00 to join us! Henry talked non stop about his Happy Meal. Costa Enterprises owns several McDonald’s in the area, but the one near Bluewater Bay in Niceville stands out from the others. It looks like any other McDonald’s from the outside, but once you step inside and see the play area, you know you’ve found a gem! It is a multi-sensory experience. 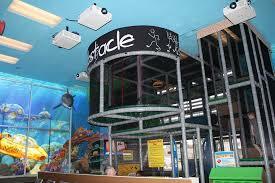 There is a multi level play zone with a small lower area for toddlers. However, Massey had no trouble climbing all the way to the top and went face first (on purpose) down the slide many times. There are projectors depicting moving underwater scenes complete with dolphins and sea turtles. One of my favorite things was that the soundtrack to The Little Mermaid was playing in the background. If you live in the area or are passing through Niceville on your way to the beach, it’s definitely worth your time to stop and let the kiddos play while you marvel at how far fast food play centers have come since we were children. Make sure you pack a blanket or a snow suit, because it was freezing in there! I’m very cold natured, but other people in there were wrapped up in beach towels, so it wasn’t just my weird body thermometer. I kept telling myself it was to kill the germs! I’m sure everyone has a tried and true cornbread recipe, but for anyone who doesn’t, this one is delicious and oh so easy! I thought it would be perfect to have with our dinner on this dreary rainy night. We’ve made the base of this for years in my family, but after Will and I married, he asked for Mexican cornbread. I added a few ingredients to my regular cornbread recipe and voila! Preheat oven to 350°. Grease cast iron skillet and place into oven to heat. Mix all ingredients except ½ cup of cheddar, until well blended. Pour mixture into hot skillet and top with remaining cheddar. Bake for 35-40 minutes. I love Italian food and my children and husband feel the same way. I am certainly not above buying a jar of sauce from the grocery store and doctoring it up, but sometimes, it’s nice to have a large pot of tomato sauce simmering away on the stove all day. The garlic and sweet tomato scent will have you ready for dinner hours before it’s time to eat! Recently, Henry was up BEFORE 5:00 AM, so I decided to start making sauce early in the morning. I may have stolen spoonfuls throughout the day, but hey, I needed to monitor it! This sauce is so easy to make and it uses canned tomatoes because every chef on television says they’re better in sauces, so why not!? After I share the recipe for this sauce, I’m going to share an alternate topping for chicken parmesan that uses fresh from the garden summer produce. I have made this sauce for a few years and incorporated played around with various recipes until I got it just the way we like it. You can always add more or less of something if you want more basil, red pepper, etc. You really can’t mess this one up! Heat olive oil in pan on low heat. Add onion, garlic, and crushed red pepper, stirring occasionally. Sauté until onions are soft and garlic is lightly golden. In a large pot, squeeze peeled tomatoes through hands or mash with a potato masher. Add crushed tomatoes, garlic, onion and chopped basil. Allow to heat and cook together for 5 minutes. Add white wine. Bring to a boil and reduce heat. Simmer sauce for 90 minutes. Add butter and sugar and stir. (more basil can also be added here if desired). Cook uncovered on low for 30 more minutes. Add salt to taste. My people don’t like squash and zucchini, so when I decided to utilize produce from my inlaw’s garden with the chicken parmesan, the alternative for them was the above sauce. Meme and Pops came to visit last weekend and brought with them a bag of fresh veggies. They included the most interesting looking eggplant, Ichiban eggplant. It has an entirely different shape than traditional eggplant, but tastes just as wonderful! Preheat broiler. Place flour, egg, and breadcrumbs in separate shallow containers. Sprinkle chicken with salt and pepper. Dredge chicken in flour; dip in egg, dredge in breadcrumbs. Heat olive oil in a skillet over medium-high heat. Add chicken, cooking 1-2 minutes on each side. Place in a baking dish that has been coated with non-stick cooking spray. Top chicken with cheese and broil 1½-2 minutes. Add more olive oil to pan and heat to medium-high heat. Add veggies except tomatoes, sautéing for 2 minutes. Add tomatoes, garlic, and salt to taste; sauté another 3-5 minutes. Spoon over chicken and top with basil. The veggie medley is fabulous on it’s own. I served it the night before with jalapeno and onion, but I ate it all for lunch the next day and needed more for the chicken parmesan! You may certainly substitute any fresh vegetables that you want to incorporate. I recommend not cooking the chicken completely in the skillet. Placing it in the broiler will continue cooking it. If fresh mozzarella isn’t available (Andalusia people…wink, wink), sliced or shredded will work just as well. You can also give the cheese a nice sprinkle of grated parmesan before popping it under the broiler. It gives the cheese more depth and cheese on cheese is never bad! I was just going to eat mine with veggies and cheese only, but decided to pour on some sauce and boy, am I glad I did! It was wonderful! The lake waters are fed by streams, groundwater seepage, rain, and storm surges. The connection to the Gulf is called an outfall and has a natural flood protection system that is beautiful and amazing to watch as it periodically opens and closes. Following heavy rains, like we’ve had lately, the outfall opens itself up and the lake drains into the Gulf. The salty sea water of the Gulf and the semi fresh water of the lake merge to form an ecosystem that is home to both fresh and saltwater species. The lake water is typically brown in color, like tea or coffee, due to the tannins released from the trees and other decaying vegetation that are in the water. The water isn’t dirty or dangerous. I’ve had multiple visitors ask me if the water is safe for my boys to be playing in! We’ve been playing in it for almost a year now and have been as healthy as ever! I’ve had a few people from home text or message me about the lake and the beach here at Grayton. 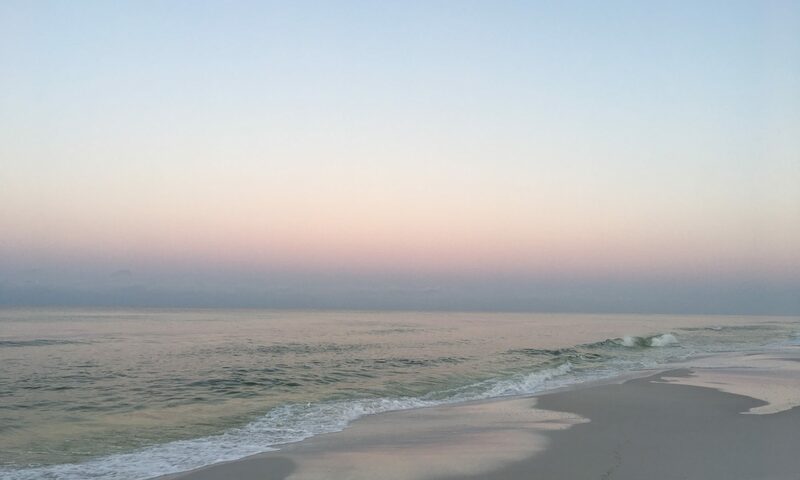 We think we have the best of both worlds-the calm and shallow water of the lake and the beautiful waves of the Gulf! It’s really the absolute best place for children and young families! Another fun thing about Grayton is that locals are able to apply for a beach permit every spring. It works like a lottery system and the permit is active for one year. It’s so awesome that they can drive right up to the water’s edge! No dragging coolers or beach chairs or whiney children….sigh….Fishing charters drive right out to the Gulf, back up, and drop the boats. I love to walk early in the morning and see them dotted across the horizon as they leave for the day. I decided to write a blog post about this a few days ago, so in between rain storms on Wednesday, I grabbed my camera and the little boys and I walked over to the boardwalk that curves around the lake into the sand at the Gulf. I took several pictures and I’m so excited that I took them yesterday because sometime over night or early this morning, the water pushed through the sand barrier between the Gulf and the Western Lake and the outfall opened up and the lake drained! Those of you who follow me on Instagram have seen where I’ve shared pictures of the pier covered in water over the last week. It’s not covered anymore! Over the next few days, the tannin tinted lake water will continue to flush out into the Gulf and the lake will become crystal clear as the salty sea water washes back in. Sometimes the outline of the lake changes almost daily. There may be a sandbar in the middle one day that’s completely dry and the next day it will be covered with water.